11-Aug-18: Pavitra Sriprakash, Director and Chief Designer, Shilpa Architects Planners Designers Pvt. Ltd. writes a weekly column on Sustainability for The New Indian Express titled “ECOLOGIC”. This week’s article highlights the importance of sleeping in beds made from a variety of organically grown fibers. Read the full article below or on The New Indian Express site. What is the first thing you wake up from and the last thing you get into every single day? It is your bedding comprising of pillow covers, bed sheets, duvets and comforters. Most people spend about a third of their lifetime or nearly 25 years in sleep! This makes beds the number one intimate environment, and reason to fuss before deciding upon what to lie. Organic bedding materials are made from a variety of organically grown fibers. While the most common organic textile is of cotton, other eco-friendly materials include linen, bamboo and hemp. Tencel is a branded fabric made out of eucalyptus wood pulp. Naturally antimicrobial it slows the growth of microorganisms like bacteria. Ramie is one of the strongest natural fibers made from an East Asian flowering plant. Known to reduce wrinkling, Ramie lends a silky luster to fabrics blended with it. Plants are grown in controlled settings with no pesticides, herbicides, or other chemicals. Only natural fertilizers are used, and the soil and water are monitored. If a fiber is to be “certified organic,” its growing conditions have to be monitored and verified by any worldwide agency or organic trade association. A fabric is labelled “organic”, if 95% of its fiber content is certified as organically grown. The top reason to prefer organic bedding is that they make a healthier option. Organic sheets are hypoallergenic due to the lack of synthetic additives. This helps people especially children with sensitive skin as there are no dyes, chemicals and pesticides to cause a reaction. The next big reason to switch is for the good of humanity. Conventional cotton farms are responsible for a quarter of the worldwide use of insecticides. Some of the most dangerous pesticides are used to increase cotton yields which enter the food chain through water run-offs. India is currently the world’s largest producer of cotton at 6.4 million tonnes annually; and its highest textile export revenue is from bedding and bath products. Indian farmers take usurious loans to buy GM seeds and pesticides and many fall into debt traps leading to an epidemic of suicides in cotton farming communities. Alternate environment friendly and cheaper farming methods could slow and even reverse this shameful malady. The worldwide production of t-shirts is 2 billion per annum. To make one t-shirt, 150 gms of pesticides and other chemicals are used, which totals to a staggering 300 million tonnes for t-shirts alone! Organic farming creates 60% less carbon dioxide and greenhouse gases output than conventional farming. Choosing organic methods supports farmers committed to producing a quality product without toxins. This helps soil retain moisture and nutrients. Fertile, carbon-rich soil enables more plants grow, and they in turn draw more carbon dioxide during photosynthesis to continue the beneficial cycle. Although, there are no approved studies yet to decisively demonstrate any health benefits, organic cotton is being widely embraced by holistic practitioners. Choosing organic products supports organic farming of veggies and grains. Many farms rotate fiber plants with food crops which incentivize ‘conventional’ farmers switch to green techniques. With many promises of goodness sleep soundly surrounded by what is great for you and the earth. 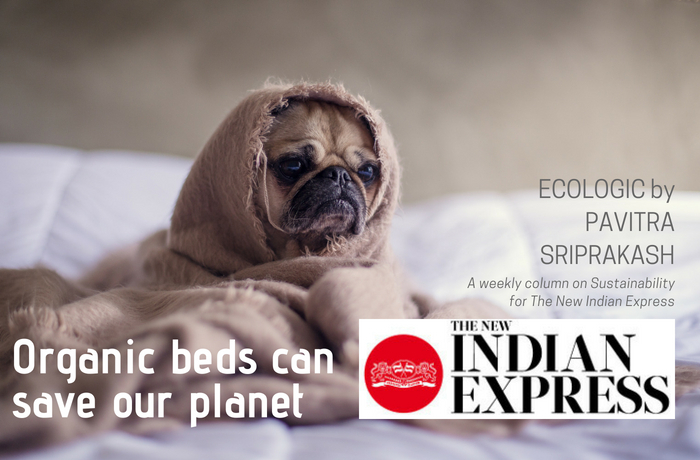 Sleep on an organic bed to save the planet! It’s that easy! Pavitra’s previous articles are available on this link on the New Indian Express website and on our Site. As always, we welcome your feedback and suggestions for topics. Do get in touch with Pavitra at admin@shilpaarchitects.com. Posted in Article External Post .